Clashes again broke out in the west Tripoli suburb of Janzour today, Sunday, as local fighters took on militias from the neighb ouring . There have been reports of heavy artillery being used and, this evening of two Fursan Janzour (“Janzour Knights”) Brigade members being killed. According to the director of Janzour security directorate, Mahmoud Ashour, five civilians had been wounded, with one in a serious condition. 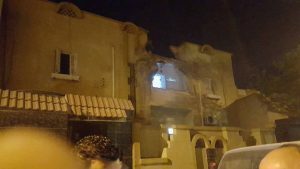 Social media showed houses having been hit by shelling, possibly as many as five. A senior commander of the Fursan Janzour, Mohamed Baruni, meanwhile condemned the Presidency Council’s (PC) silence and told the anti-PC Al-Nabaa TV they had made no effort to mediate. However, in a statement following the statement, the PC called for an immediate end to the fighting. Such clashes were unacceptable, it said, claiming that it was working hard with the different sides to prevent further damage. For its part, the so-called national salvation government led by Khalifa Ghwell, which some of the forces in Janzour now support, is reported to have released its own statement backing Janzour and calling for reinforcements against the Wirshefanis. The fighting is now threatening to result in fresh power cuts in the area. Maintenance work at the nearby west Tripoli power station had to be stopped this morning because of the clashes. The General Electricity Company of Libya (GECOL) also reported that an armed group had tried to break into the facility but were repelled by security forces. Fighting initially broke out last Thursday when a Wirshefani man was alleged to have been caught stealing a car at Bridge 17 in Janzour. After two days of fighting between the Wirshefana and Fursan Janzour, which led to local schools being closed, a tentative ceasefire was agreed last night. However, despite the efforts of local elders and a short period of calm this morning, it did not last. The lull in the fighting, however, did allow the Red Crescent to recover a number of bodies of fighters, although it has not said how many. Last night, a Fursan Janzour spokesman, Ahmed Abduljalil, said his brigade continued to be subject to random shelling. Local residents also told the Libya Herald of their fear at being hit by stray missiles.